Mexican-Americans make up the third largest ethnic/racial group in the United States. Yet few mainstream movies have explored the range of the Mexican-American experience. Two of those films—La Bamba and Selena—have become iconic. It's not just because they chronicle the lives of superstars who rose from nothing to make it in America, then died young. It's also because these movies deal with the broad themes of integration, mobility, the American dream, and the question of what it means to be Mexican-American—to live in between two countries and identities that are in constant flux. 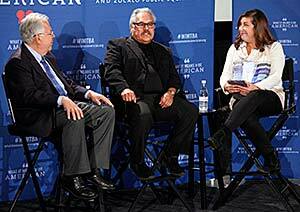 La Bamba writer and director Luis Valdez and Selena producer Moctesuma Esparza discuss the challenges and complexities of making these films—and the role Hollywood does and doesn't play in Americans' understanding of our national story. This event took place at ArcLight Cinema Hollywood in Los Angeles, CA, produced in collaboration with Zócalo Public Square as part of the What It Means to Be American series.